A manhunt is underway for a man suspected of killing a rookie Pennsylvania police officer Friday night. 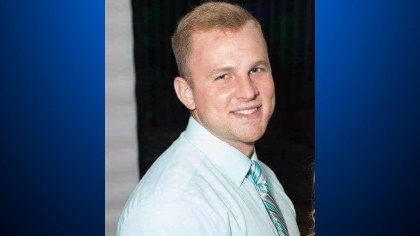 Officer Brian Shaw was shot in the chest around 8:15 p.m. Friday in New Kensington, about 18 miles (29 kilometers) northeast of Pittsburgh. The shooting occurred during a foot chase that began shortly after a traffic stop, NBC 10 reports. Shaw had served as a part-time officer in three other towns before joining the New Kensington police force full time in June. He was taken to a hospital after the shooting but was pronounced dead there a short time later, according to authorities. Authorities are offering a $40,000 reward for information on the shooting. The FBI has contributed $25,000 to the reward, while the U.S. Marshals Service offered $5,000 and the federal Bureau of Alcohol, Tobacco, Firearms and Explosives will contribute up to $10,000.